[HOUSTON]- Some of the smartest Teens in Texas will be donating a portion of their Fast Food money to Charity, in order to chow down on some Gourmet BBQ. This coming Sunday March 26, the Houston, TX. Chapters of Our Children Our Future (OCOF) and Great Inspirations For Teens (GIFT) will present “#GYMM- GIFT Your McFastFood Money. The event will feature Chef Mick Brown, Host of BBQ RESCUES! TV and a Grill Master Champion of Food Network’s “Cutthroat Kitchen”. He was also seen on last year’s season finale of “Vanderpump Rules” ( Bravo TV) catering the Barbecue Engagement Party . Celeb couple Katie Maloney and Tom Schwartz held their cookout at the famous Villa Rosa estate of “Housewives of Beverly Hills’”, Lisa Vanderpump. The Houston event starts on Sunday afternoon with a BBQ Bootcamp, where the Chef Mick will teach a select group of Teen Volunteers how to set up for a Food Fundraiser. Then Guests will arrive at 4:00pm to taste the Menu prepared by the Teens. There will also be a Cooking Demonstration by Chef Mick to show families how to prepare the Recipes at home, for a fraction of what they would spend at the Drive Thru. Chef Mick Brown on the set of Bravo TV’s Vanderpump Rules at Lisa Vanderpump’s Villa Rosa Estate. Guests must RSVP and are encouraged to “Pay What You Can”. Proceeds will benefit OCOF’s efforts to curb youth violence and offer productive alternative activities, like Sunday’s event. A relatively new organization, GIFT’s focus has been organizing holiday toy drives for underprivileged youths. They also encourage teens to actively participate in helping the community. 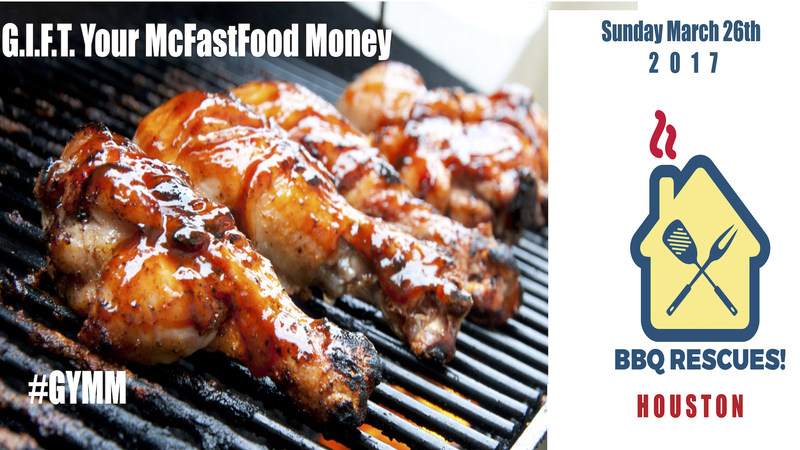 #GYMM- Gift Your McFastFood Money will take place on Sunday March 26, at 4:00pm. The location will be at 16755 Ella Blvd. #216. Guests should RSVP by calling (832) 583-6263. There is also Online Registration available on the BBQ RESCUES! Website: www.BBQRescues.com. Media should contact Larry Bertrand at (832) 583-OCOF (6263).